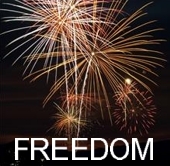 To be physically free in the country you live is reason to celebrate, like U.S. Independence Day holiday. But we can all rejoice in spiritual freedom in Christ. In the United States we will celebrate our declaration of independence with picnics, parades, fireworks, and more. Freedom, however, is not the experience of every country and people. This is a freedom available to all who will receive it. Jesus cued us in on how to become free when He said, “Then you will know the truth, and the truth will set you free. . . . So if the Son sets you free, you will be free indeed” (Jn. 8:32, 36). Help those who are not in a personal relationship with God know this freedom by reaching out to them with the Good News of Jesus Christ. Help those who have accepted Jesus as their Savior to learn to live within that freedom. This is part of the role of the Christian Education ministry of the church. Freedom in Christ doesn’t mean that we do whatever we want and whenever we want to do it. We must rid ourselves of an attitude or mindset that we can slack off and pamper ourselves because we are free in Christ and He will forgive us (Rom. 6:1-2). Instead, we must be considerate of those around us and in whatever we do live to the glory of God. One day we will have no problem figuring how to live out the freedom we have in Him. In heaven we will experience not only the freedom from the penalty and power of sin but also freedom from the very presence of sin. Let your mind dwell on that thought for a moment. Declaration of Independence, But Are You Free? On the Fourth of July, we celebrate our freedom here in the United States. The Declaration of Independence was signed in 1776, formally declaring the colonies as free and independent states. That freedom came with a price but the benefit is still felt today, over two hundred years later. We demonstrate a loyalty to our country, observing our patriotism by flying our flags and with parades, speeches, the pageantry of cannon and gun shots, fireworks, picnics and the like. Whether or not we live in a free country, we can still be free in a way that supersedes any kind of physical freedom. A price was paid by Jesus shedding His own blood so that we can be free from sin. Over 2000 years later, the benefits are still felt today. No longer bound by sin, our loyalty shifts to Him. We celebrate by worshiping and living for Him. Part of the problem of being free, whether that is as a country or spiritually, is that we can abuse that freedom or take it for granted. In pursuit of personal freedom, we can offend others and stifle their freedom. We can become inconsiderate and intolerant, not thinking of the other person because “we have rights.” In reality, don’t we then become bound in our own selfishness ambition?